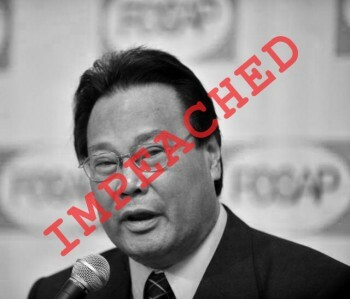 Everyone has been talking about the Senate Impeachment Court’s guilty verdict over Chief Justine Renato Corona’s case. It has been one hell of a ride for the Philippine nation which had watched the proceedings the entire time as if following a soap opera over television. But after the case has been decided upon, what’s going to happen next? What are the possible scenarios? I can think of a few things. Now former CJ Corona and his family are the first to receive the blow of the case’s outcome. But the former Chief Justice has no plans to make an appeal over higher courts (the Supreme Court). He has decided to move on. After all, he has millions of dollars to worry about. But rest assured that cases will be filed against him soon. It won’t be as well publicized as the impeachment case was but I doubt if he will ever be placed behind bars. Everybody knows he was a midnight appointee by the then outgoing president Gloria Macapagal-Arroyo. He was her ticket to freedom. His presence as the highest magistrate would ensure that GMA will never be convicted from any of the cases filed against her. Even if she does get penalized in the lower courts, she can always appeal to the highest court of justice and will be granted acquittal. Now that Corona is gone, she’s missing one major ticket to her battle against various cases. Another scenario would be related to whoever will replace Corona in the post he was impeached from. Currently, Associate Justice Antonio Carpio has been assigned the post as an acting Chief Justice until the President decides who will officially replace the post. Carpio, along with other justices had decided to have everyone associated with the SC (Supreme Court) to declare their SALN (Statement of Assets, Liabilities, and Networks) to the public. This prevents the people from doubting our justice system again due to SALN issues. This was the basis for Corona’s impeachment. Meanwhile, PNoy has 90 days to choose the next CJ. Some are already speculating that someone close to the palace will be selected for the post. Although there is a nomination process, one can’t help but think of the possibility that the President will choose his own ally for personal and political reasons. We can only wait and see. Delsa Flores, who had been referenced by the senator judges during the CJ Corona impeachment case, couldn’t be any happier over how the case turned out. She was a court interpreter who was removed from her post because she failed to declare about her small public market stall in her SALN. It will be unfair to her if Corona was acquitted for the same reasons she was relieved of her duty 15 years ago. Corona made a mistake to admit that he does have a generous dollar bank account. He was wrong to say that failing to declare everything is not enough basis for him to be impeached from his post. If a court interpreter got fired by not declaring all but a small market stall, millions of dollars not stated on a public official’s SALN should be worth being impeached for. Some law practitioners got demoralized after Corona’s impeachment. It was as if the father of them all was bullied by 20 senators, prosecution lawyers, witnesses, and the President himself who was one of the first to throw stones. Miriam Defensor-Santiago, one of the 3 senators who voted not guilty was commendable for her speech about everyone hiding something in terms of acquiring hidden wealth through politics. Nonetheless, it’s no secret why she voted for Corona’s acquittal, being a GMA ally. Lito Lapid and Bong Revilla, despite belonging to GMA’s party voted guilty. Lastly, as for the Philippine nation, we can all move on as well. We don’t have millions to spend the way Corona does but we can trust the Philippine justice system again or at least just a little. We are not Delsa Flores but we can sympathize with her believing that justice should be served not only to the poor but to the rich and powerful as well. We will not decide who will be the next Chief Justice but we will remain vigilant and protest once more in case a similar issue happens again. We didn’t decide Corona’s fate the way senator judges did but we have exactly the same thoughts about transparency among public officials, including their finances.